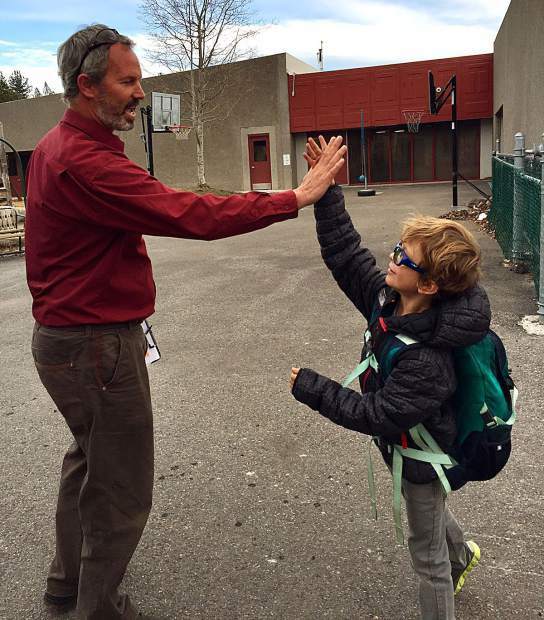 David Manahan greets a SELS student with a high five. Mr. Manahan greets students most weekday mornings and regularly serves lunch and manages bus duty in an effort to foster connectivity and approachability among students and parents. We are midway through our seventh year at SELS and have a unique opportunity to reflect on our dual community roles as educator and partner. “We are Crew, not Passengers” is our motto at Sierra Expeditionary Learning School (SELS), and it clearly highlights our foundational principles of community and service. Through academic, personal, social, and hands-on experiences, our students build skills and confidence as learners; compassion and inclusion as community members; and creativity and initiative as service providers. These experiences are grounded in our local and regional communities, helping students connect learning to what’s meaningful in their lives. SELS integrates curriculum around local and regional themes developed from State Standards; these four-five month-long units are called Expeditions. To help ground learning, Expeditions include classroom lessons, field experiences, and professional experts. Kindergarten/First Grade: In the Expedition titled “Building Community,” K/1 students survey the school community to highlight campus needs and wants. After identifying the top three and conducting a poll to determine a final choice, K/1 students work together to build this top choice. Second/Third Grade: In their study of Truckee history, students created Old Town Truckee photo history books, superimposing historic photos with current buildings and writing about the buildings’ legacy. To better understand their generation of elders, students interviewed and created historical anthologies of Truckee seniors. Working with the Truckee Downtown Merchants Association, SELS second and third graders are currently providing historical tours of Old Town Truckee every Friday in December. They also created a flyer of the “Top 10 Things to do with Kids Under 10” in and around Truckee; printed cards are located at the Downtown Visitors Center and Donner Memorial State Park. 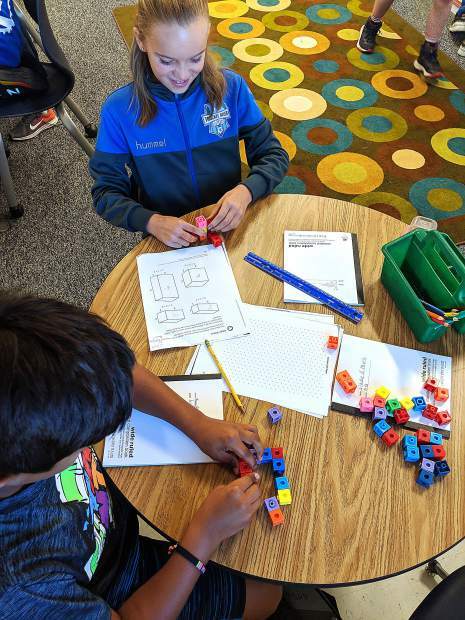 Fourth/Fifth Grade: For several years, SELS students have worked in partnership with the Donner Summit Historical Society to develop and fund interpretive signs for their 20-mile driving museum along Historic Route 40. Additionally, for the past two years, students participated in the McConkey Foundation’s Eco-Challenge contest. Student projects on water conservation and environmental garbage/plastics won first and second places in subsequent years, providing SELS with $9,000 to install low-flow toilets and wood-based stand-up desks. Sixth-Eighth Grades: As part of a geology expedition (Earth-Shaking, Mountain Making), sixth-grade students produced a documentary titled, Geology of California, 4.6 Billion Years in the Making and an eBook on state ecosystems titled All Over California’s Plates. In partnership with local conservation organizations, SELS seventh-grade students planted trees for the Sugar Pine Foundation and participated in Trout in the Classroom, which raises and releases Lahontan Cutthroat Trout into the Truckee River. In eighth-grade, our students learn about being active community members and global citizens. They have spoken at Town Council meetings advocating for the Truckee Warming Shelter, they have worked at food banks for homeless populations in San Francisco and Sacramento, and they’ve also created an on-line business to sell succulents, using the proceeds to purchase drilling wells for South Sudan. Throughout these service experiences, students reflect on the issues, their impacts, and future needs. They learn how to advocate for ideas and other people, they develop life and job skills, and most of all, they learn empathy for other peoples and places, and respect for the diversity of communities. As a school, we also work to give back to our professional communities. In October, SELS hosted professional educators from around the country for a two-day workshop on Character, Culture, and Community Building. Additionally, SELS staff regularly present at educational conferences, covering such topics as Morning Meetings, Service Learning, and Literacy Programs. We also open our classrooms to other educators with a purpose of sharing ideas and strategies on teaching and learning. At SELS, we are proud of our commitment to giving back to our communities and continue to expand our service experiences. David Manahan is director of Sierra Expeditionary Learning School within the Tahoe Truckee Unified School District. Visit ttusd.org for more.